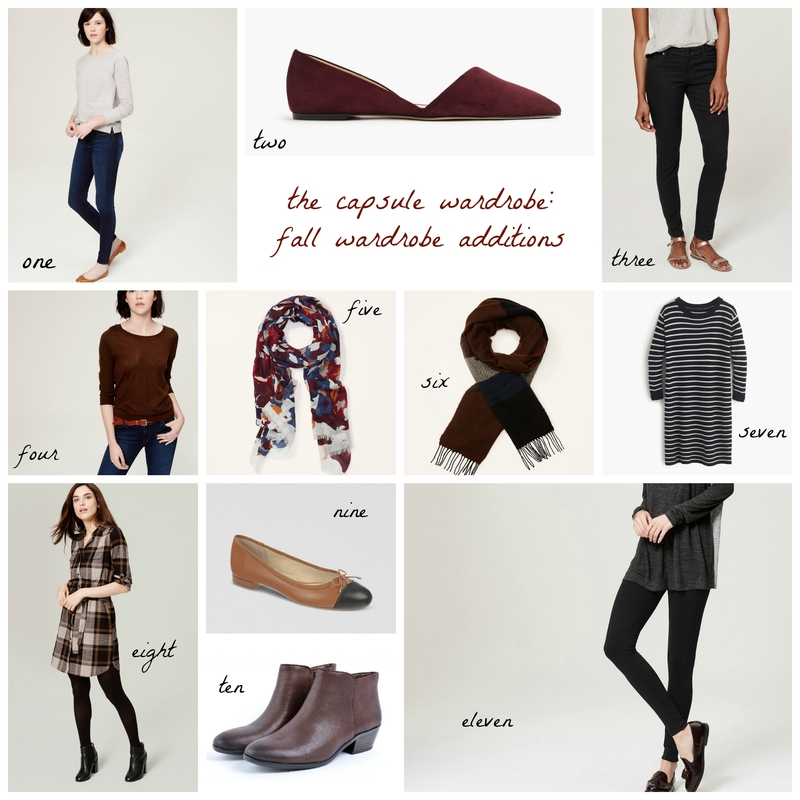 I’ve found while putting my fall wardrobe together that this time around, the process is much, much easier. I think a part of that comes down to experience, but I think it’s also because I have a much better sense of how I want to dress in the cooler weather. again, that comes with practice because it’s really fall/winter/cool spring here almost 9 months of the year, so the bulk of my wardrobe in general is for cool weather. over the years & before I ever did this capsule wardrobe experiment, I’ve learned by trial & error what works & what doesn’t. I’ve picked up 11 things over the past few weeks, and save for a special thing or two, I think I’m all set for the season ahead. one | these jeans are the perfect shade of deep, dark blue in a boot-friendly legging style that’s super flattering & comfortable. two | these flats were my splurge for the season. the merlot color is so beautiful. I love that it’s in a statement color but in a practical silhouette. thanks to boston’s no sales tax policy on clothing & shoes and a timely promo code, I was able to lessen the sting on my wallet just a little. every little bit counts, right? three | these black skinnies are replacing a much-loved pair that have faded beyond redemption. four | while I have plenty of big, oversized, cozy sweaters, I have very few slim ones that would work well with a skirt. this one has cute buttons down part of the back, is lightweight, & is the most lovely burnt orange color. note: this ran a whole size small on me, and other reviews said something similar, so if you’re interested, you might want to size up! five | this scarf has my entire fall color palette on it. I have a sizeable scarf collection but nothing that’s similar to this one. six | I’d been eyeing some blanket scarves from asos, but once I saw this one in-store at loft, I was sold. the colors are right where my mood is for fall. this scarf is really big, which I love. seven | this striped sweater dress is going to be worn to death. I have a similar one from j.crew that I bought 3 years ago that is still in constant rotation. this one is perfect for fall as it’s thick enough for cooler temps but not so thick that you’d overheat. eight | I wasn’t sure how this dress would look on me in person, but I really loved the color palette and how it reminded me of the 90s (aka, my childhood) but in a sophisticated, muted way. plus, I’m all about easy dressing, and a good dress is about as easy as it gets. nine | this may be my new favorite flat – it’s insanely comfortable, fits my wide-ish feet well, relatively affordable, & comes in a million colors. now I know why they’ve gotten rave reviews. these were a lucky find in boston at t.j. maxx for half the retail price. ten | I have plenty of black boots, but aside from this new pair, I only had another brown pair that was more cognac in color & in a riding boot style. I had been eyeing these for awhile and was saving up to buy them from nordstrom in another color, but while we were in boston, I ran across this pair at t.j. maxx and found that I liked the rich, dark chocolate a lot. bonus: they were $50 cheaper than retail + no sales tax. eleven | a pair of ponté pants is a must in my closet. it has a lot of give, which is great for comfort, but also has enough structure to look more dressy than a pair of leggings. these have really nice detailing on the seams and felt really substantial on (no see-through issues!). what have you added for fall?